Melissa comes from a family of legal minds, the most notable being her father, Lawrence Randolph Balderamos, former Magistrate and Deputy Registrar of the Supreme Court. Melissa was admitted to practice in Belize in 2002 and, during this time, has amassed considerable experience in corporate and commercial matters, banking law, conveyancing, real property transactions and real estate development, debt collection and estates and succession. She has also engaged in civil litigation on matters of all types, including contractual disputes, debt collection, real property issues, family matters and contentious estate issues. 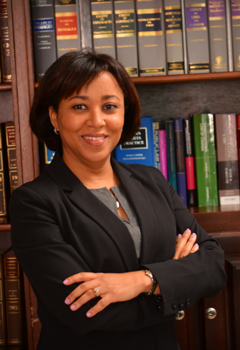 She has been a pioneer in the area of intellectual property in Belize and has amassed a wealth of knowledge and experience in this area, with extensive work in registration, protection, and enforcement of clients’ intellectual property rights. She has worked closely with the Customs Department in the seizure and destruction of counterfeit goods and anti-counterfeit efforts and has served as local Counsel for various anti-counterfeiting networks and brand protection service providers. While Melissa has argued and litigated cases before all courts in Belize, she is known for her skills and ability to successfully assist parties in resolving disputes of all types. She is a trained and experienced arbitrator and mediator. She is well known for her expertise in family matters and matrimonial disputes and has litigated and facilitated out of court settlements of countless family disputes. She has garnered considerable experience in local and inter-country adoptions under the Hague Convention and applications under the Hague Convention on International Child Abduction.